My first encounter was at secondary school: Macbeth. I hated every minute of it. I didn’t get it, not one bit. So why did I find myself giving Shakespeare a second chance? Well, honestly, it was my chance to get out of my cell, to break up the monotony of prison life. But more importantly, rumour had it that there were going to be female actors there. The session was led by this overtly camp, extravagant man and my first impression was that this was not for me. But there was something about him that I found intriguing. Looking back now I think it was because he was non-threatening and had this natural ability that I now know all good actors have, which was not to take himself too seriously. He was also on our side, he was one of us – not a prisoner but a person in that room at that time who just wanted to discover. Admittedly, it took him the best part of 30 minutes to gain the attention of all the inmates present: we were talking, laughing, doing everything but participating, but he went along with it while skilfully leading us to the point of engagement. I left the class feeling inspired… about Shakespeare. I wanted more. My journey continued after I was released, and I was lucky enough to secure the title role in Shakespeare’s Othello on a national tour, during which time I developed a passion for writing and directing. In 2006 I was presented with the opportunity to be the artistic director of Intermission Theatre, an opportunity I grabbed with both hands. 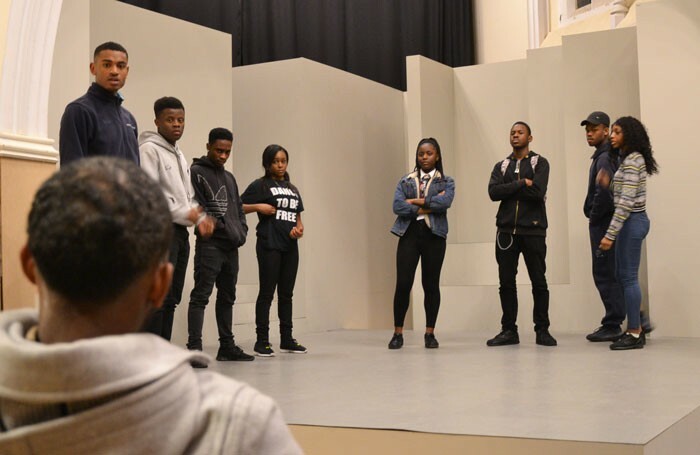 After two successful years with the theatre, I set up Intermission Youth Theatre, a company whose aim would be to work with young people from London’s inner-city boroughs who were at risk of offending or lacked opportunity. I decided that Shakespeare’s plays would be the focal point of IYT. For many of the youth members it would be their first encounter with Shakespeare, or they would have had an experience similar to mine, and I wanted to change that as someone did for me back in 2004. I wanted to get them excited about the work and give them a reason to want to read Shakespeare or want to go and see his plays. Many of the young people I captain find Shakespeare’s language a barrier, and for this reason my workshops with them often focus on the characters, themes, issues and plots. I encourage them to use their own words in replacement for the original text. This particular technique, from my experience, gets the players quickly involved and engaged as it gives them an immediate ownership of the work and they take great pride in rewriting Shakespeare. By removing what they deem to be an obstacle, you allow them to move forward. This eventually leads to a point where the players ask questions about Shakespeare’s original text and it is at their request (and only then) where I introduce the language. Let’s be receptive to change. As brilliant as Shakespeare was, why should we expect young people to care so much about his work without allowing them to have a platform for their own equally creative voices? We need to meet young people halfway, understanding their culture and language (which evolves every day) instead of suppressing it and undermining them. The key to unlocking Shakespeare is to believe you own it. Don’t be afraid to have your opinion because your interpretation is always right, it is poetry after all. A good captain also helps in any team and you need a team for Shakespeare – he never wrote a one-man play. There’s no need to be so precious with the text. If Chaucer had been shown Macbeth, he would have been horrified at Shakespeare’s bastardisation of the English language.